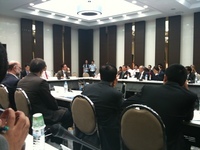 ADRC participated in this year's second meeting of the ISDR Asia Partnership (IAP) held in Incheon Metropolitan City, the Republic of Korea on 13-14 August 2009. The meeting discussed the follow-up action to the Second Session of the Global Platform on Disaster Risk Reduction (DRR), which was held 16-19 June 2009, the finalisation of the Kuala Lumpur Action Plan on DRR, and preparations for the Fourth Asian Ministerial Conference on Disaster Risk Reduction (AMCDRR), which will be held in Incheon Metropolitan City on 25-28 October 2010. Dr. Yeon-Soo Park, Vice Administrator, the National Emergency Management Agency, the Republic of Korea, put forward his comprehensive proposal for the fourth AMCDRR in a very positive manner. He also detailed preparatory steps to be taken by various partners, i.e. member state governments, international organisations and other institutions. Furthermore, participating organisations shared information on their recent attempts to follow up on the HFA midterm review, Kuala Lumpur Action Plan, etc. ADRC Executive Director Mr. Atsushi KORESAWA presented some of the ADRC's ongoing and future activities by putting a stress on the Asian Conference on Disaster Reduction 2010 (ACDR 2010) to be held in Kobe city, Hyogo Prefecture, Japan from 17-19 January 2010, back to back with other relevant meetings such as the IRP Recovery Forum. He also informed the participants that details of such events would be provided in due course on the website of ADRC. In addition, ADRC had a chance to participate in the opening ceremony of the UNISDR Education and Training Institute for Urban Risk reduction and the UNISDR Northeast Asia Office, which was held on 11 August and the conference on "Building a Local governance Alliance for Disaster Risk Reduction" jointly hosted by UNSIDR and Incheon Metropolitan City.